Series on The Sacraments starts tonight! The current week's homily is available on a link on the front page of the website next to the link for the current week's bulletin. On the page with the prior bulletins, the corresponding homily will be sitting side by side with its bulletin. We started on the anniversary of the start of the Catholic Church, Pentecost Sunday --- over three years ago. 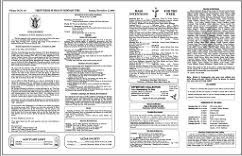 This week, the Thirtieth Sunday in Ordinary Time - Responsibilities as Citizens and Christians in Voting, is our two hundred and fifteenth! podcast to be posted. The homily is given by Father James Brady. So, take a listen and let us know what you think. Click here to download the homily from St. Landry Catholic Church, Opelousas, Louisiana. Tonight, we enjoyed listening to Deacon John Miller in The Series on the Sacraments - Part 2 - Baptism. Next Wednesday, October 31, the series continues with Eucharist at 6:30 PM in St. Landry Catholic Church. For audio of Baptism, please click here. The bulletin for the week of October 28, 2012 has been posted. Click here to see it. Tonight, the Year of Faith Seminars continue with Baptism. The talk begins at 6:30 pm in St. Landry Catholic Church and will last for 45 minutes ... with time for questions afterwards. Please come join us in strengthening our faith by knowledge of the gift of the Sacraments given to us by God Himself! The series will continue weekly covering a single sacrament each week. Below, you can see the complete schedule. You can also download last week's Intro Handout as well as listen to the Intro Audio. The current week's homily is available on a link on the front page of the website next to the link for the current week's bulletin. On the page with the prior bulletins, the corresponding homily will be sitting side by side with its bulletin. We started on the anniversary of the start of the Catholic Church, Pentecost Sunday --- over three years ago. This week, the Twenty Ninth Sunday in Ordinary Time, is our two hundred and thirteenth! podcast to be posted. The homily is given by Bishop Michael Jarrell. This is the last weekend for the St. Landry Catholic Church Cemetery Tours! See additional photos below. Today's 4 PM Vigil Mass will be celebrated by Bishop Michael Jarrell in recognition of our 10th anniversary. Bishop Jarrell is a "son" of St. Landry Catholic Church parish as well as the grandson of one of our spirits, J.P. Barnett, Sr.
Travel to a place where voices from the past will greet you as you journey back remembering more than 200 years of our history ... 2012 is Louisiana's Bicentennial year. 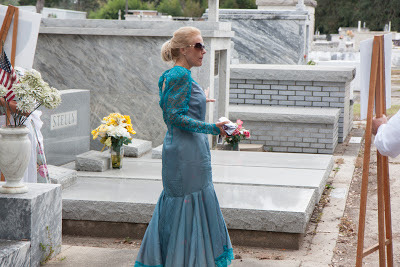 The tours of the St. Landry Catholic Church Cemetery give one a perspective into how our past has shaped our present and influenced future generations of our community. Learn which families were here and what their lives were like, and what events helped to shape our present day history. 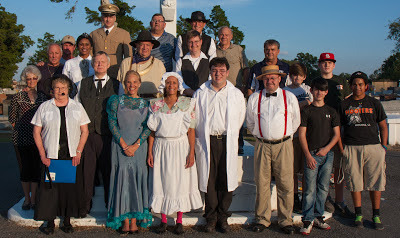 The St. Landry Catholic Church Parish, Opelousas Little Theatre, St. Landry Parish Tourist Commission along with Community Volunteers are pleased to be able to share these historic portrayals of such an important time period with each of you. All proceeds from the cemetery tours fund the Cemetery Historical Restoration Project. The tours began in 2003 and dozens of grave sites have been restored. This is our 10th anniversary year. J.P. Barnett, Sr, a local businessman involved in many of the businesses of Opelousas during the 1900's including the founding of LouAna. Find out how the growth of the movie industry resulted in the success of one of south Louisiana's most recognized products. 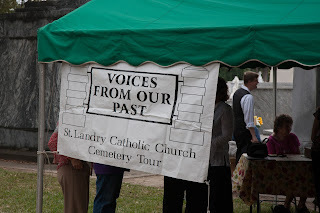 And learn about the history and architecture of St. Landry Catholic Church as told by a decorated military veteran ... and priest ... Lieutenant Father Verbis Lafleur. 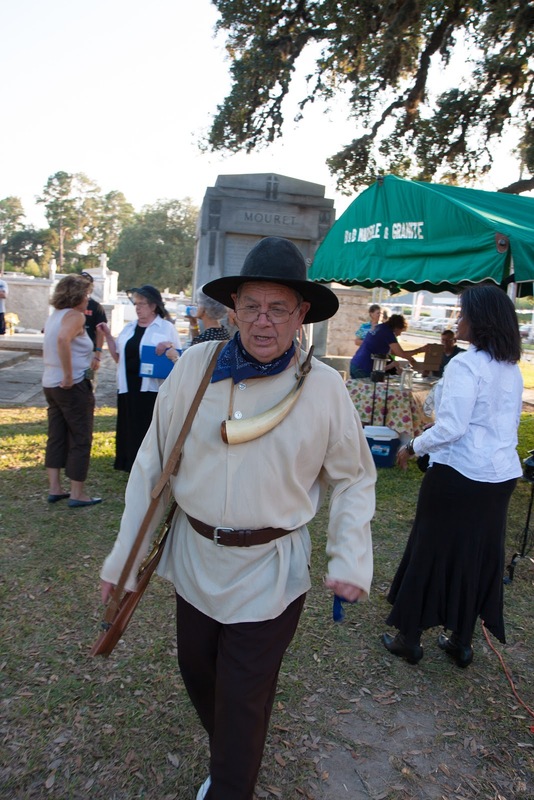 You'll also learn about how Lt. Father Lafleur was involved in educating youth during his life as well as how he is providing for the education of youth today. Please join us in remembering though who still make an impact on our community today. Your donation will help maintain our spirit's grave sites so that future generations will make sure they are never forgotten. Tonight, we enjoyed listening to Father Brady in The Series on the Sacraments - Part 1 - Introduction. Next Wednesday, October 25, the series continues with Baptism at 6:30 PM in St. Landry Catholic Church. For a copy of the handout of The Introduction, please click here. For audio of The Introduction, please click here. Tonight, Father Brady kicks off the Year of Faith Seminars with an Introduction to The Sacraments. The talk begins at 6:30 pm in St. Landry Catholic Church and will last for 45 minutes ... with time for questions afterwards. Please come join us in strengthening our faith by knowledge of the gift of the Sacraments given to us by God Himself! The bulletin for the week of October 21, 2012 has been posted. Click here to see it. The presentations will be made by Fr. Brady or one of our Deacons. Each presentation will last approximately 45 minutes followed by an optional question and answer session. Please come join us in strengthening our faith by knowledge of the gift of the Sacraments given to us by God Himself! The current week's homily is available on a link on the front page of the website next to the link for the current week's bulletin. On the page with the prior bulletins, the corresponding homily will be sitting side by side with its bulletin. We started on the anniversary of the start of the Catholic Church, Pentecost Sunday --- over three years ago. This week, the Twenty Eighth Sunday in Ordinary Time, is our two hundred and eleventh! podcast to be posted. The homily is given by Father James Brady. The bulletin for the week of October 14, 2012 has been posted. Click here to see it. And on Saturday the 20th, at the 4 PM mass, our celebrant will be Bishop Michael Jarrell of the Diocese of Lafayette. Bishop Jarrell is a "son" of St. Landry Catholic Church parish as well as the grandson of one of our spirits, J.P. Barnett, Sr. The current week's homily is available on a link on the front page of the website next to the link for the current week's bulletin. On the page with the prior bulletins, the corresponding homily will be sitting side by side with its bulletin. We started on the anniversary of the start of the Catholic Church, Pentecost Sunday --- over three years ago. This week, the Twenty Seventh Sunday in Ordinary Time, is our two hundred and tenth! podcast to be posted. The homily is given by Father James Brady. The bulletin for the week of October 7, 2012 has been posted. Click here to see it.